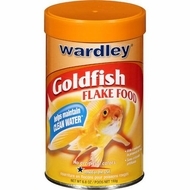 Wardley Goldfish Flakes, 6.8 oz, keep fish healthy and satisfied and help keep fish tanks clean. This Wardley fish food, 6.8 oz, has a high-quality marine protein-to-fat ratio, which supports the normal growth of your fish and also helps maintain clean water in the tank. With this fish flakes food, Wardley takes care of the science, so you can enjoy your fish.